Temple (3-0) – Scootie Randall continued his comeback by playing 38 minutes as the Owls downed Delaware Saturday 80-75. Randall and backcourt mate Khalif Wyatt chipped in 18 points apiece (45% of the Owl’s total point production), notching an efficient 51% eFG%. Better yet, the two combined for 10 assists to five turnovers, as they helped each other and their front court teammates. Fans who held their breath last season as then-freshman center Anthony Lee stepped in for then injured senior Michael Eric are seeing the benefits now. The sophomore has become a rebounding workhorse, grabbing an astonishing one in three of the opponent misses while he is on the court. Fifth year senior Jake O’Brien has garnered impressive numbers on the Owls’ offensive boards. The next two games, versus Buffalo (Wednesday) and Wagner (Saturday) should bump the win total to five. Saint Louis (3-2) – Senior forward Cory Remekun has been making up for lost time since rejoining the team (and the starting lineup) in the team in time for the Texas A&M game. Remekun has scored 30 points on 13-19 shooting (and 4-9 from the line) over the Billikens’ last three games. Remekun has grabbed only eight rebounds however, leaving the major workload to Dwayne Evans and Rob Loe (who has 11 defensive rebounds to 0 offensive rebounds). Coach Jim Crews, in an effort to breakup the Billikens’ W-L-W-L pattern this season, has tinkered with the starting lineup, mating Jake Barnett with Mike McCall in the starting backcourt and bringing sophomore Jordair Jett in off the bench. Jett has struggled in the last three games, going 3-14 from the field while committing seven fouls, and Crews may believe that if Jett returns to his sixth man role, one he played very well last season, the sophomore guard may be able to restart his momentum. Remekun’s return is good news, getting Jett back in the groove should give Saint Louis the confidence to bridge the gap until Kwamain Mitchell returns. Butler (4-2) – After their second place finish in Hawaii, the Bulldogs return to Hinkle Fieldhouse for a four game stand that begins with Division II Hanover College of the Heartland Conference. Coach Brad Stevens still has a few kinks to work out of Butler’s offense. Like 2012, Butler’s on the court success seems to be tied to their ability to convert three’s. The Bulldogs take over 40% of their field goal attempts from beyond the arc (among the highest mix in Division I) while converting at a low 31% rate, Though better than 2012’s 27% rate, Butler needs a better conversion rate for longer term success. While one would expect Steven’s squad to do especially poorly against teams with strong three point defenses, the opposite appears to be true as Butler beat both Marquette and North Carolina, two teams ranked well above average against the three point attempt, while dropping games against two teams with a porous (Xavier) or average (Illinois) three point defenses. The key appears to be whether Butler can better against the defense than others. In four of the five games played, Butler beat the team when they did better against the three point defense than others. Rotnei Clarke is rounding into form, converting his three point attempts at a 40% rate, and as long as he performs at that level, expect him to draw recognition from the conference as he did last Monday. For success that consistently translates into wins however, Kellen Dunham and/or Chase Stigall must become that second, legitimate outside threat who can ease the defensive pressure on Clarke. Xavier (4-1) – Transfer forward Isaiah Philmore, back from his three-game NCAA-mandated suspension, has had a hard time drawing court time, Travis Taylor and Jeff Robinson have opened the season so strongly that Philmore has difficulty seeing the court, much less breaking into the starting lineup. Ken Pomeroy ranks Taylor in Division I’s top 500 defensive rebounders, while Robinson makes Pomeroy’s list for offensive rebounding. And rebounding has become a key for the Musketeers’ success (and failure) on the hard court. After dropping their opening round game with Pacific at Anaheim, Coach Chris Mack’s team made lemonade out of lemons, sweeping their next two opponents (Drexel and Drake) to clinch seventh place in the Direct TV Classic. The team may have an “average” experience level, most conference observers know that while most of the minutes are going to players with upper classman status (freshman Semanj Christon has been a pleasant surprise), those players have played in the shadows of bigger names. This is for most of them, the first opportunity to carve a larger slice of the allocated minutes and role in the program. Games with Purdue (away) and Vanderbilt (at home) over the next two weeks will offer a hint on whether this collection of players can continue to make progress. Virginia Commonwealth (3-3) – The Rams’ run through the Battle 4 Atlantis Invitational turned ugly as Shaka Smart’s squad drew two ranked opponents for the first time in program history, and dropped both games. Drawing both Duke (ranked #5 in the AP) followed by Missouri (ranked #13 by AP) was unfortunate, but the Duke game was still a two possession game at the 36:00 minute mark with the margin of victory coming at the free throw line (Duke was 24-27 while VCU was 12-19) and the Missouri game came down to a three point attempt than fell off the rim. Three-point attempts can be an equalizer, but entire lineup was not consistent through both games, and Smart did not get a “good game” from everyone in the rotation. Dayton (3-1) – The Flyers extended their win streak to three over the weekend, downing Manhattan 66-58. The home stand will continue for two more games – Wednesday (Webber State) then Saturday (Northern Illinois) – before Archie Miller’s squad takes to the road again. While the front court rotation is coming along slowly, the back court rotation – seniors Kevin Dillard and Vee Sanford — along with freshman forward Dyshawn Pierre, have generated enough offense to divert attention from the lack of low post production. The Flyer frontcourt is hardly dead weight though, Devin Oliver, Josh Benson and Jalen Robinson have dominated the boards, limiting opposing offenses to a measly 27% rebounding rate for their misses. Dillard and freshman guard Khari Price can take the next two games to work on their turnovers, always a challenge for guards. Saint Bonaventure (3-1) – The Bonnies moved to 1-1 with a win in their second Big 4 (aka Little Three) match this season, beating Niagara (80-75)last Saturday on a neutral court. Demitrius Congers earned a conference shout out on Monday for his ninth career double-double (18 points and 10 rebounds). Congers has become the workhorse for the squad, playing 81% of the minutes at his forward spot while touching about one in four Bonnies’ possessions and taking one of every five shots while he is on the court. Largely overlooked is the comeback in progress by two fifth year seniors — forward Marquis Simmons and guard Michael Davenport. Both were sidelined with season-ending injuries in 2011-12 and rehabilitated over the off season. Simmons in particular has made progress with virtually every game. His share of the playing time has grown from 13 minutes in the Bonnies’ opening game to over 20 minutes each in the last two games. Simmons earned his first career double-double (12 points and 12 rebounds) versus Niagara. Collectively Congers, Simmons, senior forward (and starter) Chris Johnson and sophomore center (and starter) Youssou Ndoye have emerged as a force on the defensive boards, limiting opponents to a measly 28% rebounding rate on their missed field goals (the Division I average is about 33%). Someone should slip Coach Mark Schmidt his opponents’ line up card, St. Bonaventure is dead last in Division I Opponents’ Free Throw Percentage, suggesting the Bonnies consistently foul the wrong opponent. La Salle (3-1) – The Explorers downed Big 5 rival Villanova 77-74 in overtime, at the Gola in the only action this past week. Villanova may be struggling this season, but Dr. John Giannini, who has dropped eight straight decisions to the Wildcats, can check this item off his Bucket List. Several of those losses, the three point decision at home in 2010 and the overtime loss at Villanova last season, have been especially painful affairs. Will this win give Giannini’s squad the confidence they need to make the NCAA Tournament (no doubt another item on Giannini’s Bucket List)? Perhaps, but they face greater challenges (their two Big 5 conference mates for example) going forward. The backcourt trio of Sam Mills, Tyreek Duren and Ramon Galloway will need to be more consistent than their 46% eFG% (18-48 shooting overall, 10-14 from the line) and 0.99 PPWS production Sunday. If the La Salle frontcourt held their own on their offensive boards, they allowed Villanova a large, 41% offensive rebounding rate. Charlotte (6-0) – Coach Alan Major’s squad took the Great Alaska Shootout trophy home to Charlotte while running their 2012-13 record to 6-0. The 49ers missed the chance for a resume win when tournament favorite Belmont was upset 74-71 by Northeastern in their semi-final game. Against Northeastern, sophomore wing Terrence Williams hit a jumper on the game’s first possession to give Charlotte a 2-0 lead which they never relinquished. With a (Ken Pomeroy computed) SOS of 0.334, ranked #302 (out of 347), the 49ers could have used that date with the Bears. Though DeMario Mayfield and Chris Braswell have returned to play, neither has regained the starter’s status they had in 2011-12. They are playing like men possessed; Braswell has scored 73 points and grabbed 33 rebounds over the last five games, while Mayfield has scored 41 points, gathered 10 rebounds and dished 10 assists over his four game run. While Williams, Braswell and Mayfield have emerged as the top three offensive options, the next three players, sophomore Pierria Henry and freshmen Denzel Ingram and Darion Clark (starters in all or some of the six Charlotte games so far) draw an equitable number of touches and shots, giving Major a multitude of offensive options. The next two opponents, East Carolina (next Saturday) and Davidson (December 5) should give fans a better idea of what to expect this season. Massachusetts (2-2) – The Minutemen took the week off. Hopefully coach Derek Kellogg’s staff has had an opportunity to dissect the losses to North Carolina State and Tennessee and fix a leaky defense combined with a suddenly ineffective offense (especially from beyond the arc) to create to lopsided losses. Massachusetts fell behind early in the first half to NC State and eventually took 11 three point attempts (42% of all attempts) before the intermission. Rather than shoot them back into the game the strategy backfired (a 27% conversion rate will do that), leaving Kellogg’s squad with a 14 point hole to climb out of in the second half. They took 13 more three point attempts in the second half, ceding another four points to the Wolf Pack, for a game deficit of 18 points (76-94). Though the Tennessee game was competitive for nearly 35 minutes, a spate of defensive fouls off of Volunteer conversions turned the game against Kellogg’s squad. Senior wing Terrell Vinson picked up his fourth foul at about the 34th minute and did not return after Kellogg sat him. Junior wing Raphael Putney fouled out at the 37th minute after UMass’ defense collapsed. Shot defense will have to improve before conference play. Saturday’s game with Miami of Florida will give fans an idea of how much progress has been made. Richmond (4-2) – The Spiders, playing without junior point guard Cedrick Lindsay (concussion) went 1-1, beating Wofford (64-58) and getting hammered at Ohio (48-73) – their second road game of the season and their second loss. Getting Lindsay back for their game against in state rival William & Mary will help, but playing the game at the Robins Center will probably help even more. Coach Chris Mooney’s team is 4-0 at the Robins Center so far this season, beating opponents by an average of 27.8 points. The road has not been kind as the Spiders are 0-2 so far, averaging -20 points versus their opponents. Lindsay’s value to the Spiders comes through his assists – Mooney’s system works best when the guards find the open teammate. Sophomore Wayne Sparrow has drawn more playing time in Lindsay’s absence, but getting the point guard back will help Richmond’s offense. George Washington (2-3) – The Colonials bounced back from their loss in South Bend with a win (80-56) last Saturday over Hofstra of the CAA. Paced by Lasan Kromah’s 15 points, George Washington withstood a single tie at 8-8, took a 16 point lead (38-22) into the intermission and cleared the bench with just over three minutes left in regulation. If every game could be that easy…Coach Mike Lonergan’s squad gets defense. They have held all but one opponent to the desired less than 1.0 points per possession (in fact a very strong, per Ken Pomeroy 0.95 points per possession). The problem is an inconsistent offense that features a mix of layups and jumpers, but little by way of the long range attack that would spread opposing defense. Only 40 of the team’s 272 field goal attempts (15%) have come from beyond the arc, an attempt distribution that ranks the team in the bottom three in Division I. Forward Nemanja Mikic, averages 18 minutes per game, has taken 38% of the squad’s three point attempts and accounts for 42% of those conversions. The Colonials latest loss, a nine point 56-65 beating by Mount St. Mary’s reaffirms the numbers. GWU went 0-6 beyond the arc, with Mikic taking two of those attempts. 24-41 inside of 20 feet nine inches is good, but ultimately predictable. The visitors packed the interior, forced 25 turnovers and depressed the Colonials second half field goal conversion to 46% (down from 57% in the first half). Duquesne (2-3) – The Dukes hosted a subregional pod for the Legends Classic, closing out 1-1, with a loss to North Dakota State (43-57) and a win over Youngstown State (84-74). If the starting lineup is still in flux (especially in the front court), the sixth man spot is filled with freshman wing Quevyn Winters coming off the bench early to provide that third option on offense – and offensive rebounding option — that coach Jim Ferry needs going forward. Winters teamed and fellow freshman Derrick Coulter each chipped in 18 points in the Youngstown State win. If Winters (and the team as a whole) can cut down on turnovers and develop more consistency offensively, Winters and Coulter may find regular spots on the conferences weekly announcement. Rhode Island (1-5) – It took two overtime periods, but Dan Hurley’s squad has come off of the Division I o’fer list with a 78-72 win over Auburn Sunday. The 76 possessions taken by both teams is misleading, over a 50 minute period that really equates to 51 possessions for a regulation game, well below the current Division I average of (about) 67. Hurley’s squad was led by junior Xavier Mumford’s 33 point outburst achieved through volume shooting (11-24 overall, 8-15 from three point land). Mumford is also the team leader for steals, an area where Rhode Island lags, suggesting their defense to date is not particularly aggressive. Overall senior forward Nikola Malesevic might be the more efficient offensive option going forward, but he tends to play from the outside in, contributing little to Rhode Island’s lagging defensive rebounding, which forces Hurley to look to less promising offensive options to close the rebounding gap. Fordham (1-3) – The Rams closed out their NIT Tip-Off subregional at Lehigh with a loss to Fairfield, 71-74. Junior guard Brandon Frazier logged his seventh career 20 point game versus the Stags, but with senior forward Chris Gaston sidelined after knee surgery, Tom Pecora will have to find a legitimate second (and third) scoring option. Pecora’s frontcourt committee (sophomores Ryan Canty and Luka Zivkovic, freshmen forwards Tavion Leonard and Ryan Rhoomes) has yet to close the rebounding (much less the point) gap created by Gaston’s absence. Pecora, still without the services of 23 game starter Devon McMillan, has thrown freshman Jermaine Myers into the breach with mixed results. More effective outside the arc (6-15, 40%) than inside (4-15 27%), Myers also has problems with turnovers. More efficient scoring from others on Pecora’s backcourt committee (Jeff Short, Mandall Thomas) would help. Washington vs. Saint Louis (11/28 – 10:00 PM PT, PAC-12 Network) – This is the return game for the 2012 game played in the Chaifetz. The Billikens hung a 77-64 drubbing on the Huskies, caught the national media’s attention, and went on to beat three more power conference opponents in a row. The Bills have enough to beat the Huskies again (Ken Pomeroy favors Saint Louis), even if the game is played in Seattle. Xavier vs. Purdue (12/1 – 1:15 PM Big Ten Network) – the first of two games Xavier will play against power conference opponents to open December. The Boilermakers, though favored, are struggling. Purdue’s offense relies on shot-making and offensive rebounding for success. The Musketeers have struggled with defending, but are beasts on the boards. Massachusetts vs. Miami (FL) (12/1 – 2:00 PM CBS Sports Network) – A good resume win versus a team that should be an ACC contender this season, if the Minutemen can pull it off. The Hurricanes’ Durand Scott and Shane Larkin will be the best test Jesse Morgan and Chaz Williams get before conference play opens, but Miami’s frontcourt will take a true measure of coach Derek Kellogg’s inside rotation. Creighton vs. Saint Joseph’s (12/1 – 2:00 PM ESPN3) – A return game for the BracketBuster special of last season. The Jays and the Joe’s will contend for their respective conference titles (MVC and A-10) and both should make the NCAAs this season. The Hawks’ frontcourt will have to shut down the Bluejays’ scoring forwards, but unless Creighton’s defense has improved markedly over 2012, expect Galloway and Jones to have a stellar night. Richmond vs. Wake Forest (12/1 – 6:00 PM, no TV) – Neither team is a serious contender for their (respective) conference honors this season, but a Spider win will boost the A-10’s conference RPI, and that should help the teams at the top come Selection Sunday. Possession-based statistics are supposed to allow us to compare two teams while controlling for variations in tempo (number of possessions per game) and style. The table above largely confirms much of what Ken Pomeroy illustrates through his breakdowns. George Washington held the Irish to less than a point per possession (note the Efficiency of 96.2 under GWU), quite a feat given that Notre Dame’s offense, which generates about 1.12 points per possession, is ranked 15th in Division I basketball. Though the Hawks also held Notre Dame under their rate so far (109.7 next to George Washington’s 96.2 – divide by 100 to get the points per possession produced by Notre Dame’s offense), they were not as efficient defensively as the Colonials. Mike Lonergan’s squad failed to generate much offense, mustering only 0.71 points per possession. The problems can be traced to the Colonials’ poor shot conversion rate (34.3 eFG%). Notice that the Irish blocked over one in eight of GWU’s field goal attempts, a potential problem going forward. Saint Joseph’s by contrast got the better of the Irish on blocked shots, stuffing 7.2% of Notre Dame’s field goal attempts. 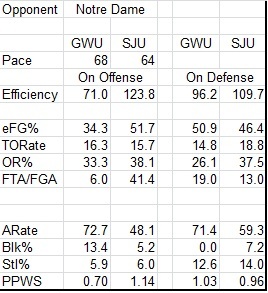 This disparity can be a problem for GW when it meets Saint Joseph’s in conference play. Saint Joseph’s success versus Notre Dame came down to the Hawks’ offense. 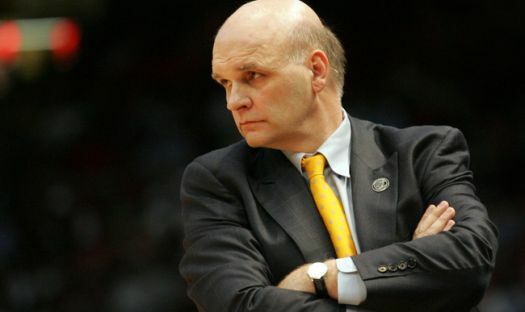 Not only did coach Phil Martelli’s squad convert nearly 52% of its field goals (note the eFG% rate), but the Hawks managed to rebound about 38% of their misses and/or got to the free throw line, two ways that can extend the possession (offensive rebounds) or develop another scoring opportunity to end the possession. A Correction – Last week’s column classified an SEC team as a Big 12 team in the piece that reviewed the A-10’s conference-to-conference match-ups. The error did not change the conference’s overall won-loss record, nor its record versus power conference opponents. This entry was posted on Wednesday, November 28th, 2012 at 9:45 am by Brian Goodman	and is filed under checking in on, microsites, other 26. Tagged: alan major, brad stevens, butler, c.j. aiken, carl jones, Cedrick Lindsay, charlotte, chase stigall, chris braswell, cory remekun, dan hurley, dayton, demitrius congers, derek kellogg, duquesne, Dwayne Evans, george washington, jim crews, Jim Ferry, john giannini, kevin dillard, khalif wyatt, kwamain mitchell, la salle, Langston Galloway, lasan kromah, marquis simmons, massachusetts, michael davenport, michael eric, mike lonergan, Nemanja Mikic, nikola malesevic, ramon galloway, rhode island, richmond, Rob Loe, rotnei clark, saint bonaventure, saint joseph's, saint louis, scootie randall, semanj christon, shaka smart, temple, terrence williams, vcu, vee sanford, xavier, xavier mumford, youssou ndoye. You can follow any responses to this entry through the RSS 2.0 feed. You can leave a response, or trackback from your own site.